On Second Scoop: Ice Cream Reviews: Happy Mardi Gras! no, i don't mean I'm at Mardi Gras, I just mean that today is Mardi Gras and tomorrow is Ash Wednesday, which means we've started the approach towards Easter! Now what better way to start thinking about Easter then by digging into a nice fresh bag of Jelly Beans. 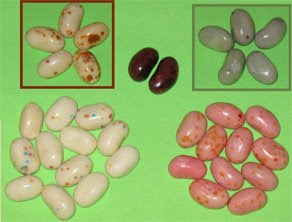 Oh man I'm a sucker for fresh jelly beans, or in today's case, Brach's Jelly Bird Eggs. At 2 grams of sugar per tasty egg, how can you possibly go wrong with these tasty rainbow delights made of sugar and corn syrup. Stop tempting me! Go back in the drawer! As you can see from the picture, the flavors aren't exactly equal. I can honestly say that the birthday cake ones are my least favorite. The only one I don't mind is the strawberry blonde ones, not great, but not too bad. The other flavors are ok. 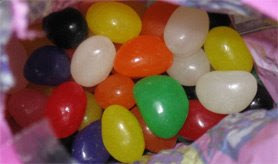 The problem is that I'm old school, I eat white flavored jelly beans and yellow jelly beans and all the other colors, though there was one flavor I refused to eat as a child, can't remember which though. 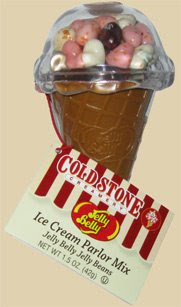 To me, the world of jelly beans is separate from the world of real flavors, I just don't want them to be mixed. So while I appreciate the unique gift, I have to be honest and say I wouldn't buy them again.